It’s like buses. You wait for ages for one, then two come along at once! So close on the heels of yesterday’s long awaited “In a Vase on Monday” post, I can’t wait till next week for the next one! It comes, though, virtue of an “accident”. Some of my stems of Echinops had escaped their support. I’m ruthless now, and since they showed no desire to be caged up again, they had to be cut back – flower buds and all. However, my conscience is always salved, if any material can be recycled in a vase for the house. These stark buds seemed to lend themselves to a simple display. I chose a collection of glass medicine bottles, with one stem in each. It may be simple, and not as frothy as my rose bowl, but gives the poor buds an extended life, giving a bit of pleasure indoors. I wonder if they’ll flower! This entry was posted in The Cuttings Calender and tagged cut flowers, Echinops on June 28, 2016 by thelonggardenpath. 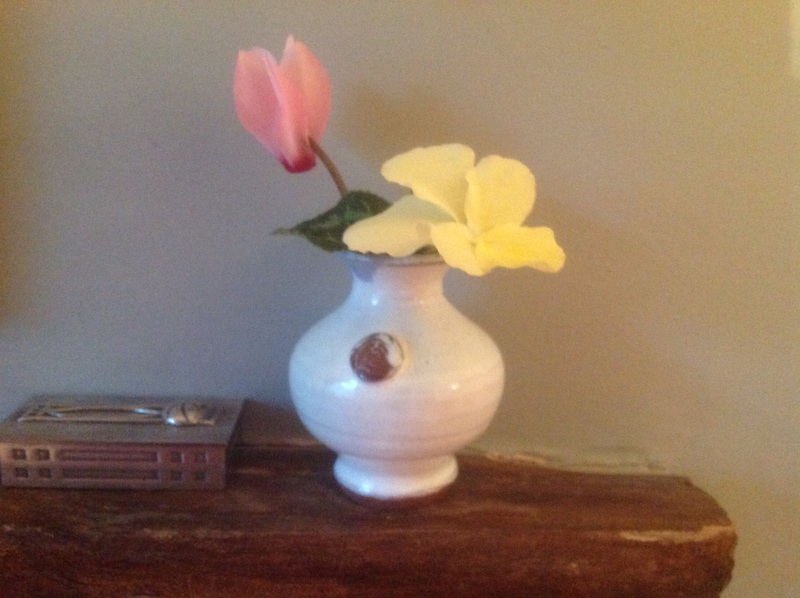 In a Vase on Monday – A New Rosebowl. I had to join in today! I have just treated myself to a rose bowl. I have long thought about having one, not just for roses, but for any flower display. It seems to me to be a perfect solution for displaying many types of flowers, keeping them well supported and displayed. After scouring several local charity shops, I even had a choice of two. I plumped for the simpler, beautifully cut glass bowl. 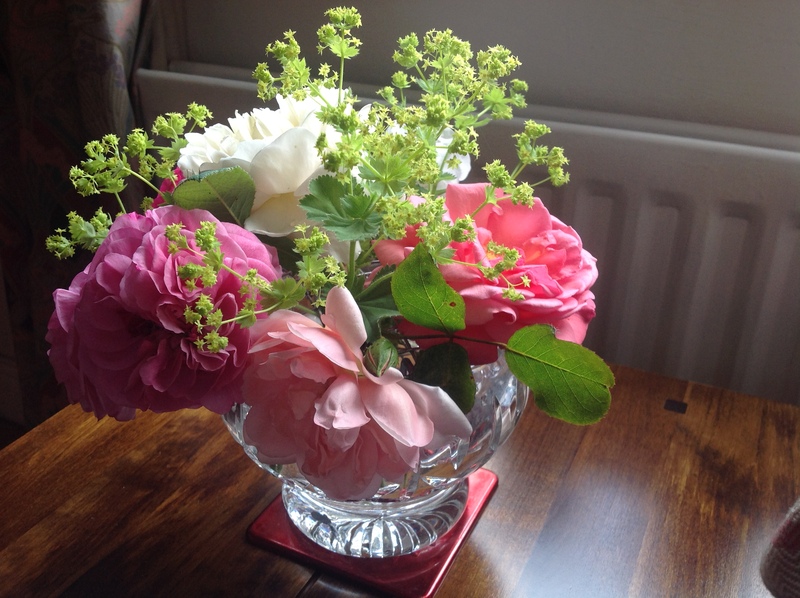 Of course, the timing was perfect, coinciding with the first flush of roses, so what better way to christen my new bowl. I picked a bloom from each of my roses currently in bloom, not wanting to deplete the garden display too much. 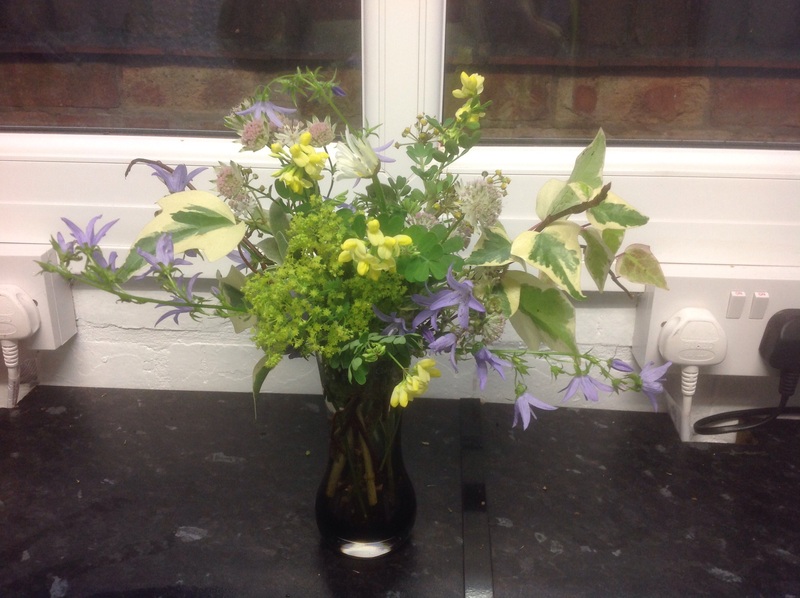 They sat in the bowl quite well behaved, and I filled out the gaps and softened the overall posy with sprays of Alchemilla mollis. How beautifully it combines with the roses! And how good it smells good too! I can see the bowl getting much use! 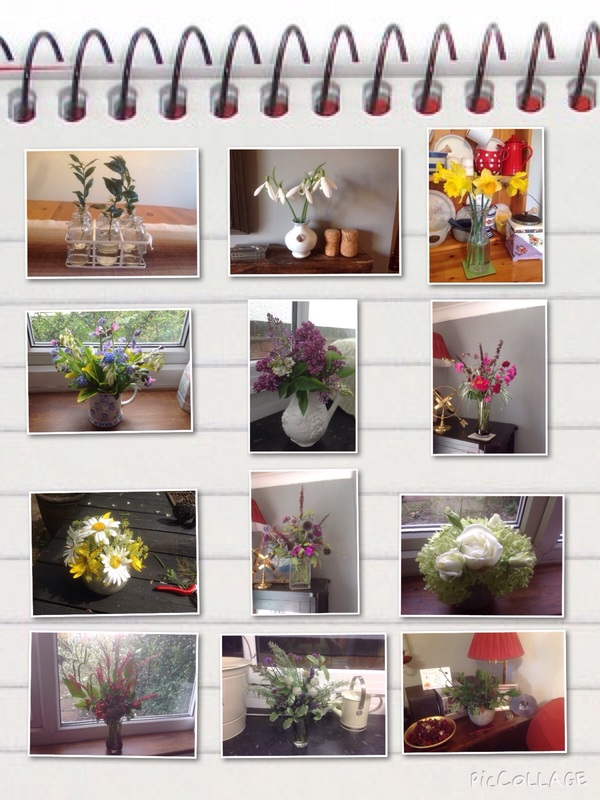 I’m joining in with Cathy at Rambling in the Garden, who started this meme and faithfully shows us her beautiful and imaginative arrangements every week. Please pop over and see her contribution this week! 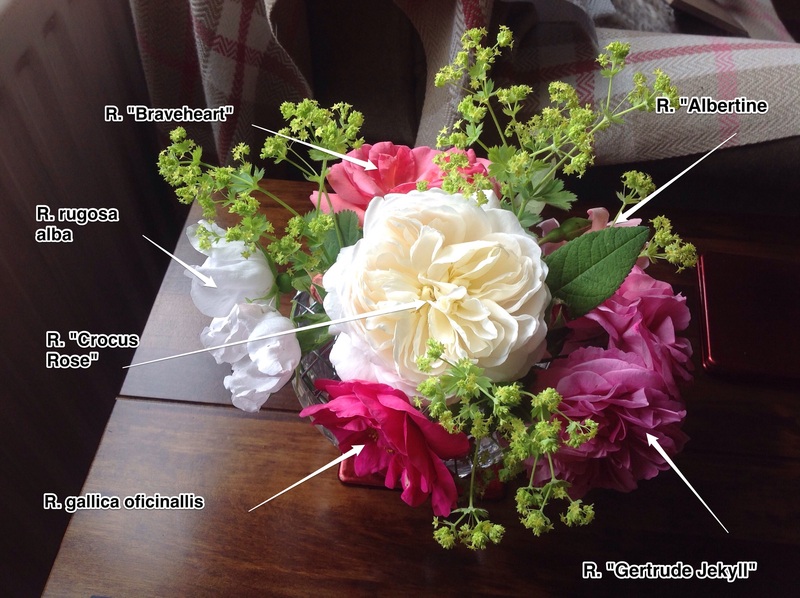 This entry was posted in The Cuttings Calender and tagged Alchemilla mollis, cut flowers, Roses on June 27, 2016 by thelonggardenpath. 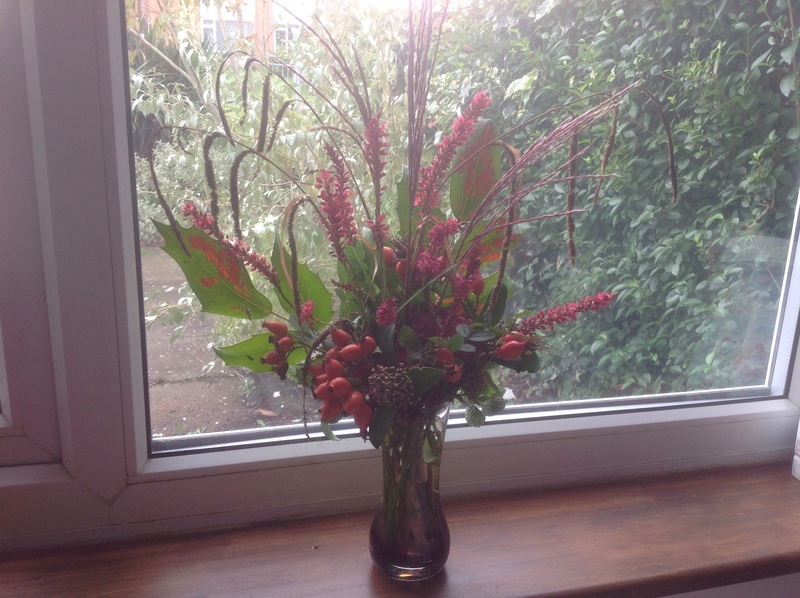 In a Vase on Monday – But a Day Late! I’m so impressed with it that I wanted to show it off, by joining in with Cathy, at “Rambling in the garden” and her meme. I do hope she’ll forgive me for being late! 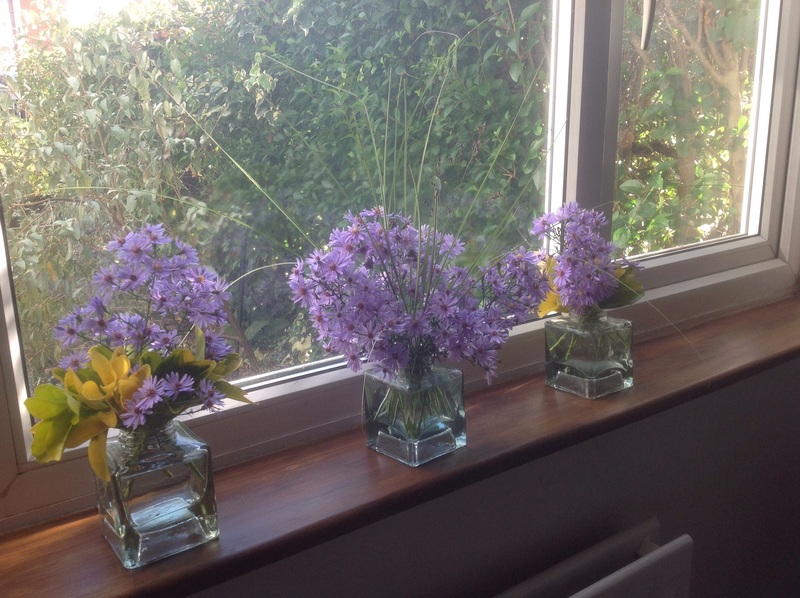 Like so many of you, I’ve become very fond of cutting flowers from the garden to bring indoors, with the result, I wanted to try growing some this year, specifically for cutting. I’ve never grown Dahlias before, but thought they would be ideal, to grow in pots with this aim in mind. While strolling past a nearby florist, earlier in the year, I noticed baskets full of summer flowering bulbs for sale. Two dark red ones instantly appealed to me. 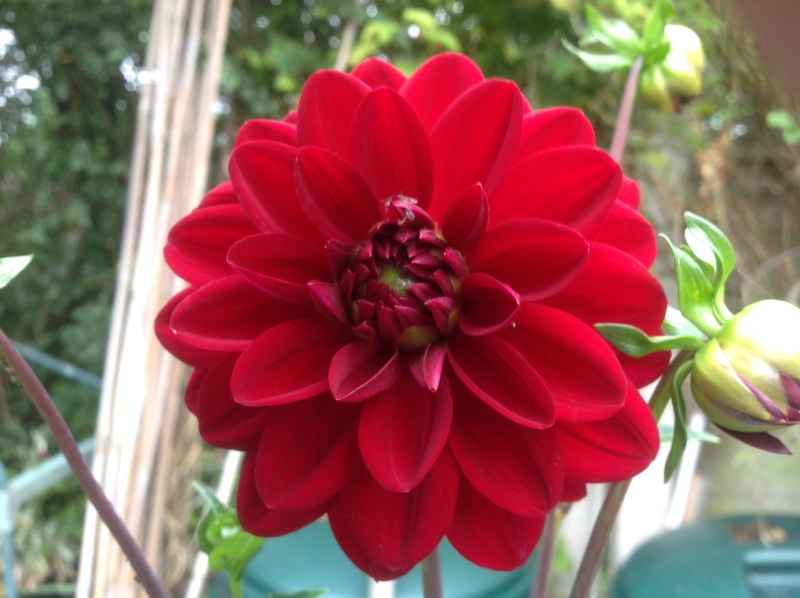 This one is “Natal”, a pompom dahlia. It’s turned out to be an absolute stunner, I hope you agree! Sadly, the other hasn’t amounted to much. The tuber wasn’t the healthiest, although it did shoot, but it has just become mollusc fodder. Which is the way my other pots of flowers for cutting – Ammi majus, which I adore, and have been desperate to try, and Didiscus “Blue Lace”, a new one on me, which looked interesting, scented with pale blue umbels – have ended up. 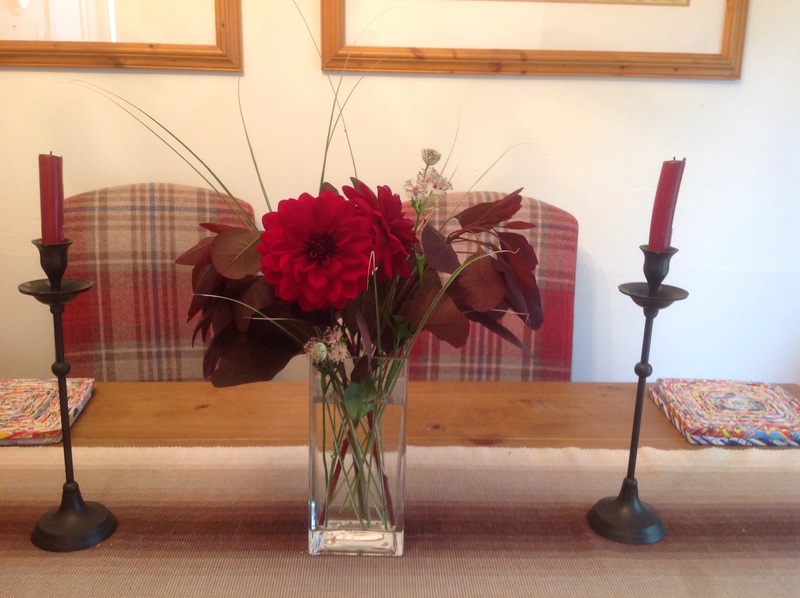 But, at least I have my dahlia – and some sweet peas! So back to the vase! 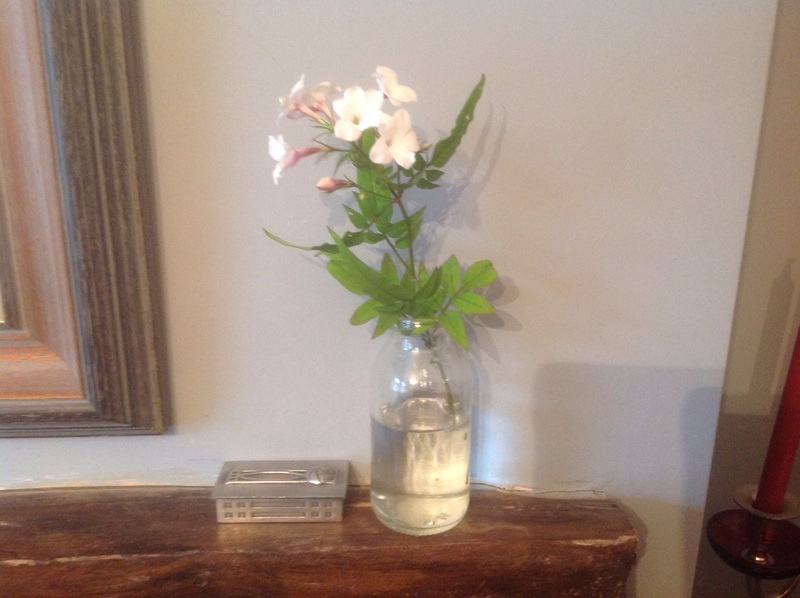 I just cut one stalk, which had two beautiful flower heads on it. There’s still another two left, with loads of buds in waiting. I thought the dark chocolate coloured foliage of Cotinus “Grace” would set them off beautifully and provide a bit of a prop for the single stem. It did need a bit of lightness, though, to alleviate the darkness, so I added some silvery blades of Miscanthus “Morning Light” and then came across some stems of Astrantia, which were white, with similarly coloured splashes at the base of the flowers. Should pick up the dark red shade perfectly! Funnily enough, the whole vase blends beautifully with the decor in the dining room, complete with complementary candles. Cathy will hopefully appreciate the props! 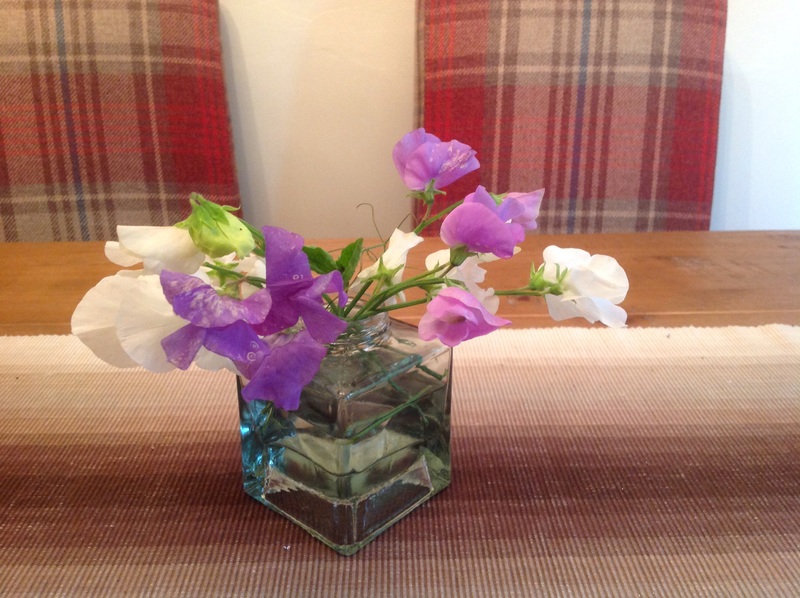 Oh, and the sweet peas came indoors, too! This entry was posted in The Cuttings Calender and tagged cut flowers, Dahlia, sweet peas on July 28, 2015 by thelonggardenpath. 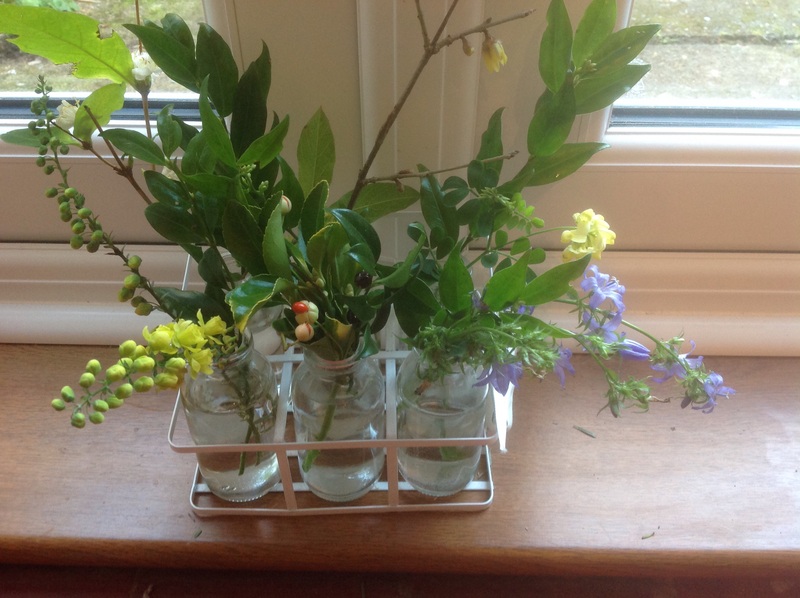 The Cuttings Calender – December ….and the Calender! Well, I managed it! 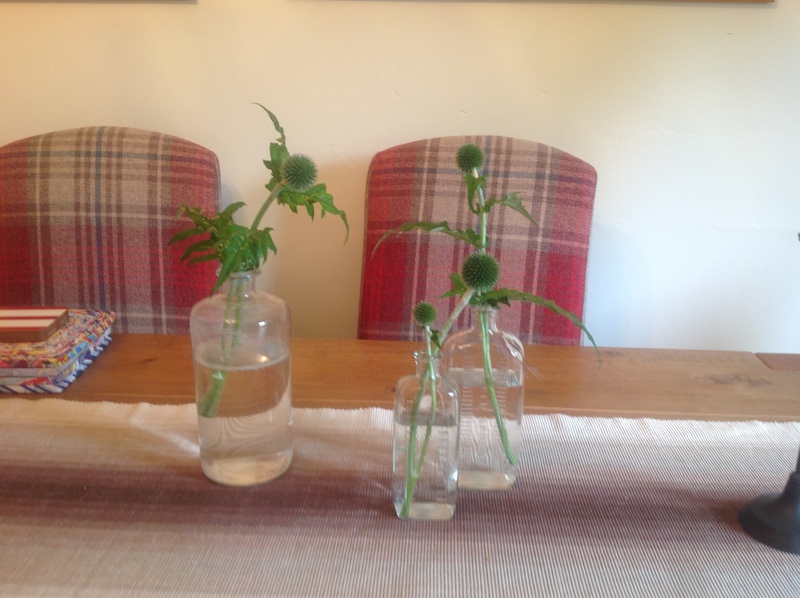 A year of continuous vases in the house, cut from the garden! It’s been a delight, both in the doing and the viewing! I did think I might fall by the wayside, especially towards the end of the year, as material becomes more scarce, but I was surprised by my own imagination. 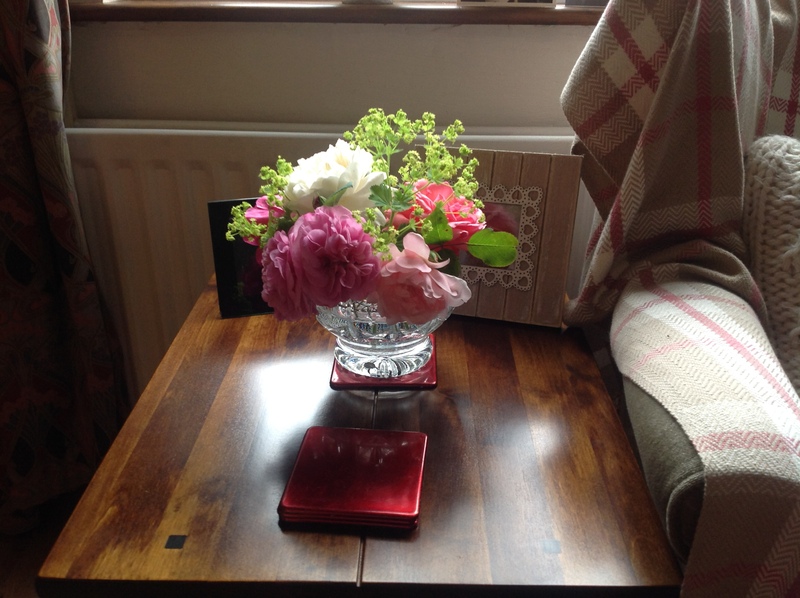 And I was helped by the inspiration from fellow bloggers who contribute to Cathy’s weekly meme “In a Vase on Monday”. Cathy’s blog is “Rambling in the Garden” – most enjoyable and inspirational, so please, do go and have a look! Seeing what others achieved gave me many ideas. So thank you all! My December vase had to be the Christmas one. I had to include the Christmas necessities of Holly – both green and variegated – and Ivy – again variegated, complete with their berries. I chose to also include some Christmas Box (Sarcococca). Sadly, the traditional red element was lacking. I struggled to find many red berries in the garden. They must have all fed the birds, since they had been there earlier in the month. 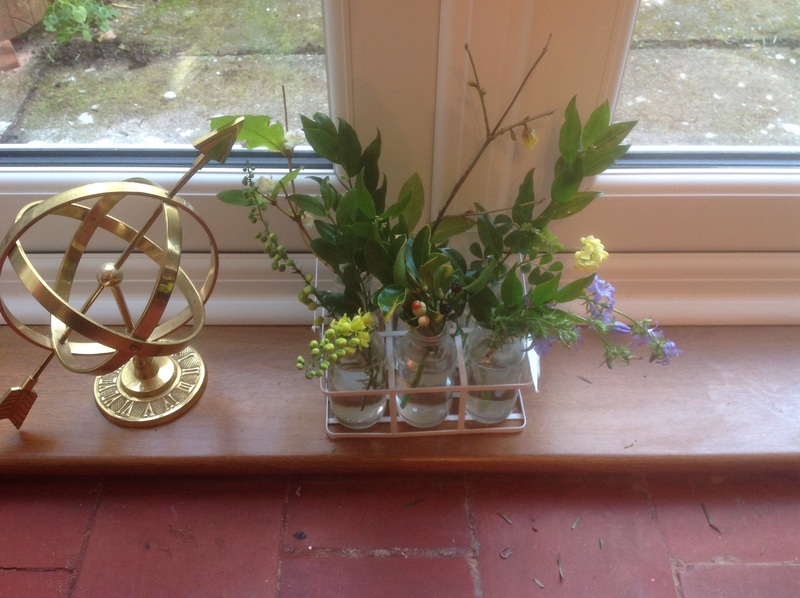 The only red element I could find were two holly berries and a couple of sprigs of Skimmia “Rubella” buds. 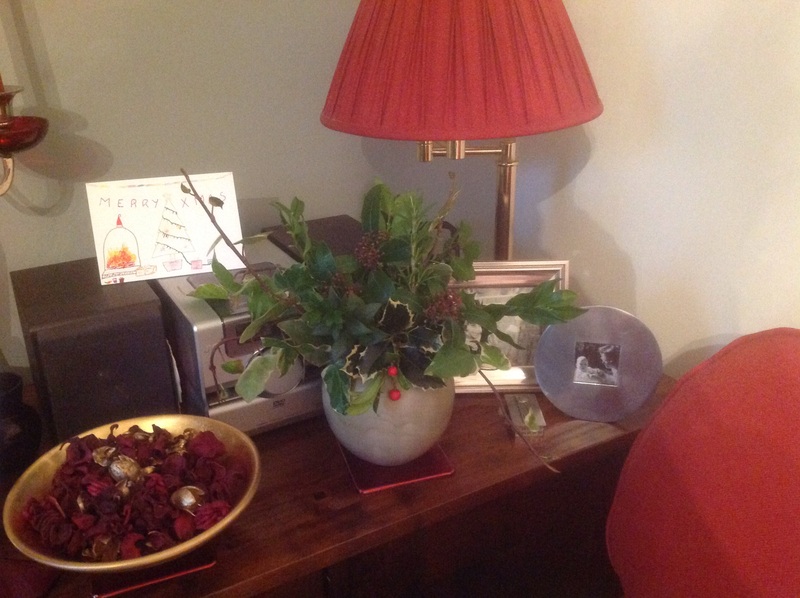 Never mind, I had the props to finish it off, in the form of some Christmas pot pourri and a beautiful hand made card. And our colour scheme helps too! I must confess to using the language of flowers, in a bit of a sentimental moment, by adding a sprig of Myrtle for good luck and one of Rosemary for remembrance. 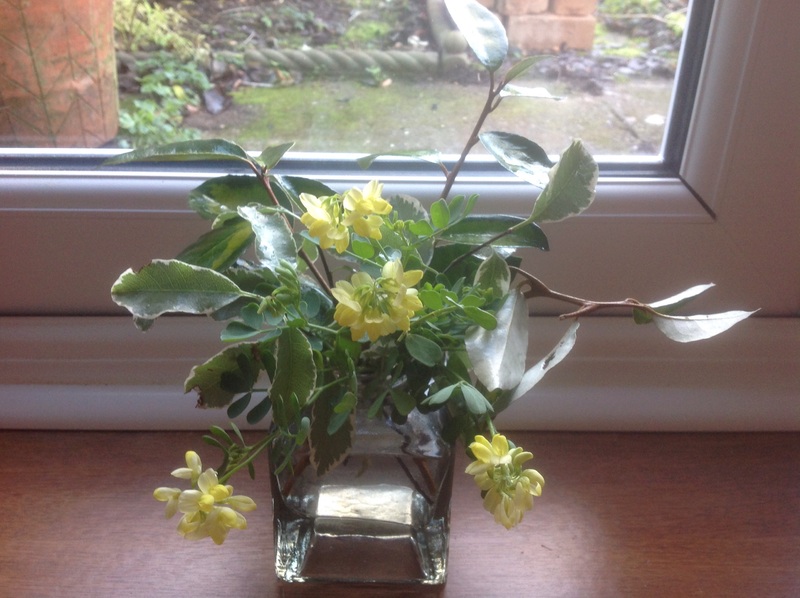 Earlier in the month, the vase was decidedly more pastel, using the newly blooming flowers of Coronilla “Citrina”. These flowers are beautifully scented and their leaves are a lovely glaucous blue, so I chose some creamy lemon variegated evergreen leaves to set them off, in the form of Pittosporum “Silver Queen” and Elaeagnus “Limelight” to accompany them. As the last vase faded, I was faced with a bit of a problem. 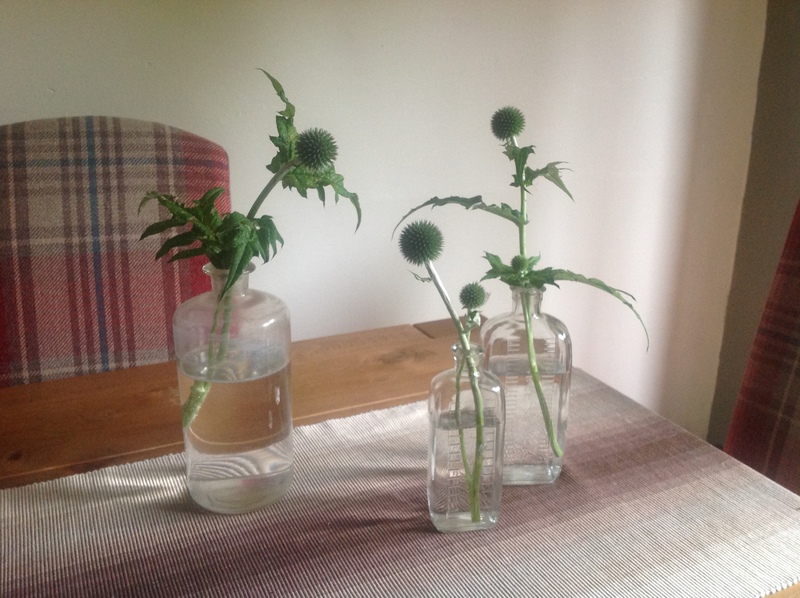 It would be several days before I could get into the garden in daylight to concoct the next vase (I’m no lark!) and no way could this vase last. Then inspiration struck! What could I pick from the doorway? Our front porch is overwintering our olives and myrtle, the latter sporting some magnificent juicy, black berries. So by the light of the hallway, the follow-on vase was concocted! Ok, a modest little number, but a pleasing little vase nonetheless! To round off the year is the “Full circle” vase I showed in my last post. 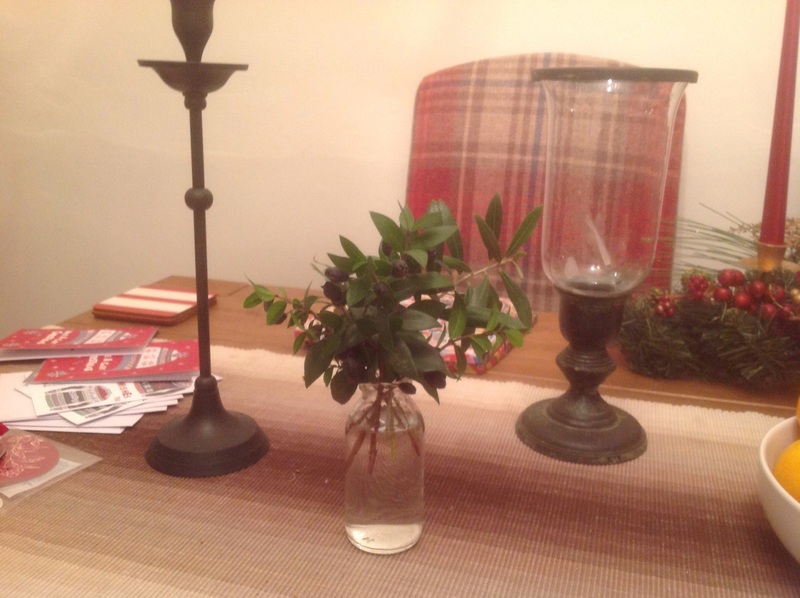 It’s based on the first vase I did, in my little milk bottles, using sprigs of Sarcococca, but this time with a few added winter blooms. Standing proud at the back, are scented sprigs of fresh Lonicera fragrantissima and spicy Chimonanthus praecox alongside the delicate Coronilla again. On the sidelines are a beautiful sprig of Mahonia japonica with its tiny daffodil-like flowers and the ever flowering blue Campanula. In centre stage are some berries, including the cheeky tongues of the Euonymus berries – I just love them! And this time I found a suitable prop in the form of our brass armillary, displaced from its normal site by the Christmas decs. Somehow it seems appropriate for a New Year vase! My Cuttings Calender for 2014!! This entry was posted in The Cuttings Calender and tagged Coronilla, cut flowers, Holly, Ivy, Milk bottles, Myrtle, Olive, Rosemary, sarcococca on January 24, 2015 by thelonggardenpath.